Improved engine performance for greater competitiveness Release of The 2006 model Yamaha 2-stroke YZ Series Motocrossers - News Releases | Yamaha Motor Co., Ltd.
On July 28, 2005, Yamaha Motor Co., Ltd. (YMC) will release on the Japanese market the 2006 models of the liquid-cooled 2-stroke motocrossers "YZ125", with new specs for further maturation in the engine and chassis to boost overall competitiveness. On the same day, the 2006 model of the upper class model "YZ250" will be released with new specs in the chassis for further maturation. Also on the same day, YMC releases the 2006 versions of its popular entry-level motocross models "YZ85/YZ85LW" with changed seat surface and side cover graphics. The motocrosser market today is divided into users of 2-stroke machines and users of 4-stroke, but the majority of the more experienced and advanced users are choosing 4-stroke motocrossers, and we see more 4-stroke machines in top competition categories such as the Motocross World Championships, AMA Supercross (U.S. championships) and the All Japan Motocross Championships. On the other hand, entry class competition participants or young users tend to pick 2-stroke models, which offer instantaneous power and a lighter feeling, with the 2-stroke 125cc models being especially popular among entry level riders. 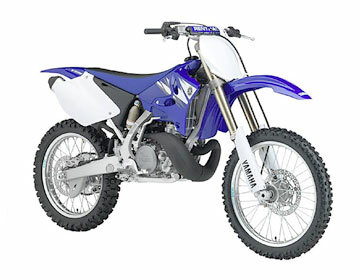 While maintaining the characteristics of the 2005 models that offer a higher level of handling that is easy to use even for beginners and highly competitive performance, the 2006 models YZ125 and YZ250 feature enhanced overall competitiveness by adding new technologies throughout. In terms of the engine for the YZ125, acceleration characteristics are improved mainly by modifying the combustion, induction and exhaust systems, and other changes are made at the same time to meet new regulations. The chassis is matured for further improvement in the handling performance for which it already has a strong reputation. These improvements make the YZ125 the strongest motocrosser available for a wide range of user needs from beginners to experts. Also for the development of the new YZ250, its already excellent running performance and competitiveness have been further improved by specification changes in chassis details and adoption of a new exhaust spec to meet new regulations. The combustion chamber shape has been redesigned to achieve better combustion characteristics in the high-speed range. For the spark plug, a BR9EVX plug is newly adopted. This VX plug uses platinum-alloy in the central anode (0.8 mm) instead of the conventional nickel to help bring out better acceleration performance in combination with the taper-cut outside anode. The shape of the air filter joint has been changed to increase space efficiency around the rear assembly while also contributing to excellent intake efficiency. Also, in order to accommodate the new combustion chamber shape and the above-mentioned intake spec changes, the JN taper shape has been changed and the bypass port changed from a 3-vent type to a 2-vent type. This not only serves to compensate for the noise resulting from the improved combustion efficiency but also helps bring out smoother acceleration thanks to optimum fuel supply characteristics. Also, in connection with the above-mentioned improvements, the CDI unit's ignition characteristics have been adjusted to achieve outstanding mid- to high-speed performance. A new governor spring spec has been adopted for the YPVS mechanism to provide outstanding torque characteristics. This helps achieve smooth torque continuity from low speeds all the way up to middle and high speeds for smoother, more linear rpm development. The silencer (muffler) spec has been changed to accommodate a new competition regulation calling for a 2 decibel reduction in noise. The partition pieces have been changed from the existing steel t0.8mm spec to an aluminum t1.2mm spec and the tail pipe from the existing steel t1mm spec to an aluminum t1.5mm spec, and the positioning moved as far forward as possible to contribute to a lower center of gravity for excellent body balance. Compared to the existing silencer unit length of 350mm, the length of new unit is 427mm, but despite this larger size, virtually the same weight balance as the existing model has been maintained. The silencer spec has been changed to accommodate a new competition regulation calling for a 2 decibel reduction in noise. The partition pieces have been changed from the existing steel t0.8mm spec to an aluminum t1.2mm spec and the tail pipe from the existing steel t1mm spec to an aluminum t1.5mm spec, and the positioning moved as far forward as possible to contribute to a lower center of gravity for excellent body balance. Compared to the existing silencer unit length of 425mm, the length of new unit is 477mm, but despite this larger size, virtually the same weight balance as the existing model has been maintained. The new rear arm adopted for 2006 is made by the "hydroforming" technique (used since 2002), a manufacturing method that shapes the aluminum stock by applying pressure to the inside in a way that creates a smoother and more precise form. This new rear arm helps achieve excellent chassis balance thanks to a re-evaluation of the right and left balance of the cast parts around the pivot and increased lateral rigidity. Synergy effect with the light aluminum frame adopted since the 2005 model contributed to achieve outstanding chassis balance. The air-oil separation type upside-down front fork with 48mm diameter inner tubes, which provides more stable performance by preventing air from entering the cartridge chamber, has been improved by (1) revising the strength balance between the outer and inner tubes, (2) use of Kashima coating on the pressure tank, (3) use of a polished Kashima coating on the piston rod to reduce friction, (4) revised cylinder diameter (25 mm - 24 mm) improved primary cushioning character, (5) adoption of a low-friction oil seal and (6) revision of the secondary cushioning generating system. The combined effect of these improvements produces both greater comfort and shock absorption and makes it possible to achieve continuing cushioning effect in competition. The rear suspension is a new beta type titanium spring with greater fatigue strength and tenacity. With an original two-phase heat processing performed before and after the coil is formed, it is given outstanding strength and fatigue tolerance. Compared to the present steel spring, the new spring itself is 500 g lighter, which contributes to a reduction in unsprung weight for boosted suspension performance. Also, the diameter of the damper rod has been increased from 16 to 18 mm and the amount of oil displacement increased to improve the cushioning characteristics, especially in the low speed range. Furthermore, the combined effect of a 30% increase in the gas chamber capacity to ensure more stable performance and the reduced friction achieved with the new Kashima coating (previously Alemite), helps bring out excellent performance. The front assembly has been given completely new dimensions to further improve the excellent handling performance. The cast aluminum handle crown features greater longitudinal and torsional rigidity compared to the existing part. Meanwhile, the forged aluminum under-bracket has about the same rigidity as the existing unit in the lateral direction and increased longitudinal and torsional rigidity on between 10 and 20%. The combined effect of these changes contributes to excellent chassis balance. The aluminum handlebar is the same Renthal-made part used on the 2005 model. Also, the handle crown and handle mount bracket have been designed separately and given an offset in relation to the center axis. This has made it possible to include a two-step handlebar position adjustment capability in the front-rear direction by changing the front-rear alignment of the bracket. In addition, a new seat material has been adopted for greater comfort. The material is characterized by softness in the initial contact and increasingly firm body hold as deeper pressure is applied. Also, to bring out the full effect of this new material, the depth of the cushioning below the hip point has been increased in comparison to the existing model. The contact portion of the seat has been finished in a flatter shape without mounding for a quality appearance and greater riding comfort. Same type of seat surface as the YZ125 and YZ250 has been adopted to improve holding quality when the rider is sitting. New graphics the same as those on the 2006 models YZ125 and YZ250 have been adopted. 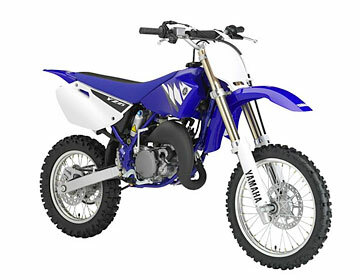 The 2006 Model Yamaha Motocrosser "YZ85"
The 2006 Model Yamaha Motocrosser "YZ85LW"